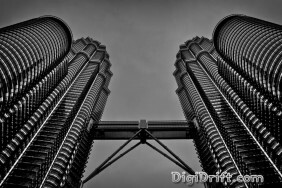 The Petronas Towers of Kuala Lumpur are an amazing architectural feat. The buildings were the world’s tallest up until 2004, but have now been well surpassed by the massive, Burj Kalifa in Dubai. The outside of the 88 floor towers are clad with polished metal, and beam in the afternoon sun. Without a wide angle lens, it was difficult to get them into a single frame. I had to lie on my back, on the edge of the street to capture this shot. Hello there! If you are new here, you might want to subscribe to the RSS feed for automated updates of all new posts. Please join the discussion and leave a comment.